I am super thrilled to let you know that we have been awarded the “Best retail brokerage firm in India for 2018” by the National Stock Exchange (NSE). This wouldn’t have been possible without your support. Thank you. I would also like to use this opportunity to address another issue that we face constantly. From our very first day, there have been naysayers who’ve said that the business model of Zerodha wouldn’t work because we charge so little. Despite 2018 being our eighth, and our most successful year, we still see baseless rumors and misinformation about us being circulated on WhatsApp and social media inciting people to not trade with us. I would like to share some facts that I hope you’ll keep in mind when you come across such smear campaigns. It may come across as bragging, but this really is the only way for me to let you know that we have never been better. NSE themselves have just christened us the “best retail brokerage firm” in India. We get audited almost every 6 months by various exchanges, depositories, and SEBI. If there is anything wrong that we’re doing, we obviously wouldn’t have won this award just yesterday. In the last two years, we’ve won similar awards from E&Y and Economic Times (ET), some of which involved complete financial audits. We are amongst the most well capitalized pure retail brokerage firms in India. We have over Rs 400 crores of promoter capital deployed in the business and we have zero debt. If there was to be any kind of volatility in the markets, like in 2008 where many brokers went bust, you as our client are best placed to come out unscathed, thanks to the strength of our financials. We take extreme pride in all our products and everything you can do with them. They are all today the largest and most popular in their respective spaces. Do check them out if you haven’t already. At over 2 million trades a day, we are probably the largest retail brokerage firm in the world, not just India. The technology effort involved in supporting all of this is huge. Apart from all our cool products, the only reason we are able to run this business at such low brokerage costs is because of our tech team, the best in the industry. Yes, we have had technical issues, but the majority of those have been due to the limitations in the underlying infra in India and our difficulties in getting our third party dependencies to scale at our pace. We have our operations team of over 1000 who slog it out every day supporting over 1 million clients, and onboard over 50k new clients every month. Our team has a united vision and thanks to that, we enjoy the lowest attrition rate in our industry. Unlike other brokerage firms, our employees do not have revenue targets, ensuring nothing gets mis-sold. We don’t differentiate clients based on their networth. We are extremely conservative when it comes to risk management (RMS). If we had an option, we would reduce leverage offered to as little as possible. There is enough data to prove that lower the leverage, the higher the probability of winning. Also, the fewer leveraged risks we take as a broker, the safer it is for you as a client. Our educational initiatives, Varsity, Zconnect, and Tradingqna are one of its kind run by any brokerage firm in the world. They have helped us get into the top 15 Investing related websites in the world. We have spent tens of thousands of hours sharing knowledge for almost a decade with no expectations of returns. We don’t advertise, we don’t force collection of leads from these portals, and neither do we have excessive branding. We do this with the goal of growing the Indian capital market ecosystem. Through Rainmatter, startups are now able to leverage everything we have built and quickly introduce niche platforms that India would otherwise may have never seen. Smallcase, Streak, and Sensibull are great examples. I can keep on going, but I’ll stop here. The constant rumors and lies being spread about us on social media has prompted me to write this very personal letter. But remember “GREAT POWER COMES WITH GREAT RESPONSIBILITY”. We all retail investors and traders trust you. Congratulations sir, We wish all the best..
CONGRATULATIONS . KEEP ON INVENTING & HELPING INVESTORS. MAY GOD FULFILL YOUR DESIRES. Congratulations Mr Kamath and team zerodha. Congratulations on such a great achievement. Hard work and sincere efforts always bear fruits. DEAR NITHIN, CONGRATULATION FOR YOUR SUPER ACHIEVEMENT . This is really amazing and great that you have received this award under such circumstances! Congratulations! There were, There is, There will be – Naysayers, always! You know, I haven’t seen any other trading platform that is as simple as Zerodha without any annoying banners, blah blah blah! Am really happy that you guys got the award that you deserved and am happy to be a part of Zerodha community. Hearty Congratulations Sir. Blessings to achieve more and more in future. Sir to me Zerodha is the best platform. I am customer of Zerodha since last 4-5 years and its the best brooking house, what i can say. Lost to much of money in giving Brokerage in Angle broker earlier to this. Proud to be a part of revolutionary brooking partner. Congratulation Team Zerodha. Keep up the good work. Congratulations Zerodha team led by Nitin. Keep up your honesty and transparency to become the biggest brokerage house in near future. we are very happy to hear this news.congratulation to zerodha team. Globe’s. No 1is your target & I see this @ your team’s heart.I made u notice to such ambiguous rumour to your downstrem being in first bencher of Keen observer ,I remain dare always,lastly it is our capital only we trade. Stochastic RSI is missing until now. Thank you for making available such an awesome Trading Platform. Am still in the Learning & practicing space. ” GOOD AIN’T GOOD ENOUGH IF IT CAN BE BETTER”. We are working on integrating trading-view charts within Kite, which has stochastic RSI. We will keep you posted. For your service at low cost. Congrates, wish you all the best for bright future. And Thanks to Zerodha because of low brokerage we are also enjoying for trading. pls improve the sales after services. my friends new account opening is pending with u from 10 days. no one contacting us. We are sorry to hear that Shreyas! Could you please give us your friend’s registered email or phone number so that we can look into this? We are looking into various alternatives to overcome the Bank nifty OI restriction issues. We will keep you posted. I hope you guys do best and best forever.. I wish once again team and CEO of the company . Congrats to your vision and the team that accomplished this. I see your eyes always locked on to the customer centric approach in its entireity with complete transparency.Zerodha is a good platform for all ,from a beginners to stalwarts.I could see your desire and aspirations to give more and more, the best you can offer to customers interms of knowledge, ease of operation, good technology, continuous improvements and all these at a very low cost! Kudos to you and your team. Please ensure technology that can withstand swelling growth and adequate back up. congrats . keep doing good work. all the best. We are looking into the possibilities. We will keep you posted. Great Zerodha team,keep it up…Congratulations. Now more expectations from you for another path of great services. I also proud to become zerodian . Keep going to achieve many more . All the very best.keep it up. Wish you all the best and sure you will maintain your high standards. Nithin, in our life we have to face many hurdles. Never mind. We are with you. Congratulations Nithin and Team Zerodha. Zerodha is my first trading account. I am with zerodha since 2014. I mostly use it for investment. Its been a good experience. keep it up. Sir mera PNB bank account h….m Apne demat account m paise kaise send karu ….jise ki m share market kr saku. I’m hopeful and glad with team Zerodha. congrats, very easy to cope up with zerodha, keep it up. Congrats…You should achieve more milestones in future.. Keep it up..
First of all…. Congratulations to team Zerodha….. Today I feel this award for me also as I have attached with this team since last three years. I have referred my 10+ friends to open account with Zerodha and today I have great pleasure to say that approx 30+ of my friends are having their account with Zerodha. Once again thanks and Many Many Congratulations to entire team for this achievement. Congratulations Nithin and Team Zerodha !!! Congratulation Zerodha Team!!!! Keep up the good work. Fabulous performance! Congratulations, Team Zerodha! May you win this award and more for each of the next 300 years. We are proud of Zerodha. Congratulations Sir and team Zerodha !!! Zerodha is a disruptor in the Stock Market / Brokerage Industry. All the products of Zerodha have disruptive innovation & have greatly benefitted the Small Retail Traders / Investors. Keep on disrupting the Stock Market Industry, you guys have best wishes of Lakhs of Small Retail Traders / Investors. Nithin, congratulations and keep up the good work! Your products speak for themselves. We are equally proud to be zerodha’s clients. Please always keep Zerodha’s products (streak, smallcase etc) well within the reach of small customers during next many years to come. Congrats to you and your team Nitin..!! I am sure you will keep innovating and all these awards inspires your team to achieve many more wonders..!! Congratulations Zerodha team. Well deserved. Congrats Sir. Zerodha compete Worldwide and i am sure Zerodha will become a Master of Universe in Share Retail Brokerage. Super achievement without deviating from core values. Best ever brokerage for all, particularly small and new investors. Hearty congratulations to ZERODHA team. Ur priceless efforts will bring u mountain high. Congratulations to team Zerodha and the fans (rather not say customers). I like to be called as fan. I shared this post with my office colleagues who thought Zerodha ko koi bharosa nahin kab bhaag jaaye. Love you guys. Keep rocking! Congratulation sir. Keep it up. We can shine more if we make our partner dashboard more intuitive. Please write to [email protected] with your feature request. They will look in the feasibility and get it implemented. Well done Zerodha !!! You deserve the award for low brokerages but as always we expect flawless tech systems from your team. Let people say! Its good you put your point forth. We already trust you and believe in your products and the (mature) startup you are now. Keep growing! It’s really awesome and most deserving award for zerodha. Congratulations to the whole team. Congrats Nithin and the team of Zerodha. I really liked the above article which is honest and straight from the heart. God bless you, your company and all your employees. I especially liked the way, you gave the credit to one and all (your employees), rather than taking the entire credit yourself. In this present day world of greed, your decision of not going for massive expansion (in spite of it being available so very easily for a company like yours) at the cost of your values is very much commendable. We’re sorry to hear that, what seems to be the issue, is there anything specific we can help you with? The zerodha is best brokarge firm with customers facilities. Thanks for your best work. Zerodha is a REVOLUTION !!! Congrats to Zerodha team. Lots of gaps have been filled by Zerodha. It meets my needs as a great execution platform. There are some issues but I have seen this with almost all the brokerages. Great work!! Congratulations👍. Let’s keep growing together. Congrats Nithin Ji and Team Zerodha. Keep growing. I’m an investor today all because of you… otherwise brokerages just like sharks dont let you to enter the sea. Congratulations to u guys and keep up the good work. I agree it’s the best when it comes to brokerage..
Congratulations for your hard work and appreciate your effort. But this is my humble request please kindly arrange to changeover facilities of referrals which your customer if willing to do so, because like me maybe many willing to do this. Could you please elaborate what you mean by changeover facilities of referrals? Congratulations. Keep up the good work…..
Congratulations to the entire Zerodha team. You have done a commendable job. The platform is clearly the market leader! Congrats Bro. You really deserve it. Congratulations team zerodha.. keep it up and maintain the success… Thank you zerodha for providing us such a smooth and successful trading platform with low brokerage. Congratulations and I wish more successful milestone. Congratulations Nithin and Z Team…. we always support zerodha and always with zerodha. Because zerodha work for their clients benefit that’s why I joined zerodha. Congratulations sir with best regards. Congrats to all Zerodha employees and partners. I am proud to be a part of Zerodha. Nitin & Team Zerodha…..you guys are doing good job! Thanks for the fabulously simple platform! GREAT. CONGRATULATIONS. PL. KEEP IT UP. You deserved & got it. I am thrilled being a client. My experience with you is rated as Excellent. Congratulations. God bless your team. Congratulations Mr.Kamath & the vibrant team Zerodha. Continue the good work. All the best. Congratulations Mr Nitin and TEAM. Best of luck for the future. But need some changes on system. Many complaints raised to the customer care but not resolved till yet where as ICICI direct response was good compare to zerodha. Many Congratulations. Zerodha is the BEST. Way to go Mr. Kamath. Congratulations to Nitin ji and Zerodha team. Kudos to all. keep up the good work. We are already working on this. We will keep you posted. Congratulation to all team of zerodha…Our support with u….Hope u all will provide the best service to us in future too..
For market timings please refer to this support article. With regards to Sensibull please write to [email protected] and they will help you out. Congratulation Sir and all team of Zerodha. Congratulations! Zerodha team,Keep it up…. Congratulations Mr Nitin and whole zerodha team. Pl have suggestions box, by which I can improve further. Pl put a option of stop loss in positional calls, in future and option section . We are working on Good till cancelled orders(GTC). If you have suggestions you can write to us on [email protected] We will implement your suggestions if they are feasible. Glad to see. It all is your genuine work and dedication towards trading. Thanks for easing the way, and we are moving ahead of others who have vested motives, rather than a passion towards stocks. Good & Keep up! Please raise a ticket here on our support portal and our support representative will get in touch with you. Congratulations to all direct-indirect team members . We are already working on implementing GTC orders. We will keep you posted. Really your trading platform and service is excellent…..Congratulations for the award. Congratulations Sir Mr Nitin and whole zerodha team. Well, I had to scroll down a lot to get to comments section!! This itself shows what a feet Zerodha has achieved and I’m proud that I’m a part of it. This is great news, awesome. Congrats Nithin and the entire team..
You are very inspiring Nitin Kamath…keep going..! Congratulations and keep up the good work … Cheers. Congratulations sir best wishes for next step! Many many congratulations to team Zerodha for achieving such great award , with hope to many more such types of achievements in coming future by management/team Zerodha. I wish you all best and hope soon Zerodha to nominate for the best brokerage firm globally as well. I am proud of myself for being in the right place. Congratulations sir, I’m so proud to be zerodhian. Great, well said.. good message.. thanks.. we love you..
Congratulations nitin sir wish u all the best. We will continue to work on improving our platforms. Could you please elaborate on what you mean by settlement issues? Many many Congratulations nitin sir wish u all the best. I can only say that you guys are doing a great job. Congratulations and all the best for the future. I am a small novice trader. I am really glad i started my trading carrier with zerodha. Hope in future will grow with you more. Congratulation on such a big success which was obviously coming at one point of time. Many Many Congratulations for Zerodha. If possible in future Please increase for the retail investors leverage limit from 14 to till 40. Check out this post on TradingQ&A to know why we offer the leverage we offer and dont plan on increasing it in the future. Congratulations Nitin Sir & Zerodha team, truly deserved. Kudos to Team Zerodha!! Amazing products you have and trading app is top notch!! Keep doing wonderful work. Zerodha is quite great but I would like to point out one difficulty that I have been facing. Portfolio view and its functionality of Zerodha app & website is very poor compared to that of Angel Broking. I would be glad to explain it further if it can be improved. Sure, you could write a mail to [email protected]. If its feasible we will implement it. But now with ICICI coming with the option of instantly being able to transfer the funds into the bank account out of the shares sold, it is going to hold a great advantage over Zerodha. Now raising capital and coming up with some different innovation that would be able to counter this kind of disruption. Offering Instant withdrawal for a certain amount, is on our list of things to do. We will keep you posted. Well done. Dont get bogged down by what other’s say. Keep up ur good work n be the No 1. You can read Nithin’s response regarding the article on arbitration here on TradingQ&A. We do not place orders without the customer’s consent. We place orders on behalf of the customer only if they have requested on call or for square off of their MIS/BO/CO (@3:20PM) or loss making positions. Check out our margin policies here. Congratulations. We feel proud to be your client. I am a newcomer in this trading platform, I am enjoying but not having a clear picture about it. We don’t provide research or advisory services. As a newbie you can check out the Kite user manual and Varsity. You can always raise a ticket on support.zerodha.com if you have queries or need help regarding any of our platforms. Congratulations Sir, we feel proud to be your client, We wish you grand success in all walks of your life. Congrates Nitin sir & zerodha team members, future is really bright. And really zerodha is life changer. Keep it up. Best navigation team award,it is.In the short period could experience it. Keep on with your mission to serve India better. Congratulations to team Zerodha. Wish you many more laurels and success in the years to come. Suggestion : It would be great help if market depth of the stocks are shown in the holdings also like in positions. We already show the market depth in holdings on Kite web, just click on ‘options’ by hovering your cursor on top of the stock. We are coming out with the Kite 3 mobile app, here, you will be able to view the market depth of stocks from your holdings. Congratulations to Nithin namath the man behind the business model and team zerodha for achieving such milestones. I am really thankful to you all. Since I have joined at this platform the trading experience is Amazing. Heartly congratulations to nithin kamath sir and his team. Congratulations to you and the entire team for this award. It’s nice to say that I am associated with the best platform for trading…keep up the good work .. Many many Congratulation nitin sir and zerodha family. I am proud of being a part of the zerodha family. You can use UPI to transfer for free (also NEFT/IMPS/RTGS). Zerodha team, Happy to know. Congratulations Nithin, and Team Zerodha. You guys really deserve it. Congratulations Sir. This Recognition will support the Zerodha team serve the clients more efficiently. Thanks a lot. Congratulations! You have opened a world of investment opportunities by empowering the average investor with the required knowledge. Congratulations all Zerodha team for your hardest working. Hi, congrats. May God bless you and yr team for yr great initiatives. Thank you! We will continue to work on improving our customer service. Congratulations to whole zerodha team. I also proud to part of zerodha . Keep going to achieve more and more. best wishes to team zerodha and all its customers. Congratulations Nitin & Team, We wish you all the best for your future endeavors. Trust on Zerodha is getting stronger day by day as it is broadening the horizon to tap all the areas of investment through simplicity. Nitin, I am a more kind of “mutual fund” guy and I want Zerodha to take care of all my related needs. ECS is something we are eagerly waiting to be implemented to make our lives easier. Can we expect this to be on our plate next year first quarter? By bringing ,disruption in broking arena in spite of naysayers , you have democratized investing at an opportunity time. You had been a pioneer in zero brokerage and I hope you would bring many more land mark innovations to empower us,the very small investors. May you live to see thousand springs. Many many congratulations Nithin sir & Zerodha Team. The rumours which are floating around doesn’t bother me as I know how satisfied I am with zerodha’s services. Even I have recommended many friends to be a part of Zerodha family. Thank you zerodha team for the excellent services. Many congratulations to THE team ZERODHA. Many more to acheive. Congratulations Mr.Nitin. Great job. Keep up the good work and aim to achieve much more going forward. I switched over to Zerodha last year from a prominent broker. They were trying all the tricks to dissuade me from migrating, but still I went ahead. My good wishes. Have a successful future ahead. Sir, when will you tart giving collateral against G-sec? It’s on our lists of things to do. We will notify all our clients once we go live with this. Well-done team Zerodha! There is indeed Zero “Rodha”, in your path to success. Way to go!! Congratulation Sir and your entire team whose efforts are seamlessly,You have opened a world of investment opportunities by empowering the average investor with the required knowledge. You are deserve for this award. Congratulations for your achievement. I feel proud to be associated with you & ZERODHA team as client since last 10 years. I know what you have mentioned !! The idea is to have it handy at the time of trading… I won’t be remembering the exact cost of every script in my portfolio… Checking in P&L is secondary. I’m suggesting a proactive approach. Great! Keep up the good work. God Bless you & your team. Congrats. Zerodha Team, our best wishes with you all. Congratulations sir, I wish you all the best..
Congratulations to the entire team! Keep it up! congratulation zerodha team and nitin sir…. Congratulations! I have only recently joined Zerodha but I’m loving it more everyday! Keep it up & Dont worry about other critics. what you are doing is great.Regards. Naysayers can go to hell! It is the feelings of your million customers that matters. Congratulations and keep up the good work. I just learned you are the recipient of the annual Doe Performance Award, and I can think of no one more deserving. Your administrative contributions and innovative ideas have lifted to new heights. This has been a record year. This award recognizes that much of your success is directly attributable to your efforts. You have a bright future, and I look forward to our continued association. If you’re trading options do check out https://sensibull.com/. It’s free to use till December 15th, 2018. Congratulations Kamat sir and your zerodha team. Congrats Nithin…you guys deserve it! Hearty Congratulations. Keep it up and Wish you all the best in your zeal for more innovative products that helps investors/traders on Zerodha. Awesome feat…I wanna leave my job and apply to work at Zerodha right now after reading this…looks like you have amazing work culture…! Nimagu haagu nimma thandadavarigu haarthika shubhashayagalu. Congratulations to you on winning The best retail brokerage for 2018 from NSE. keep it up. Further i would like to wish you very bright future in the coming years. Thank you Rakesh 🙂 We will continue to work on improving our platforms and customer support! Heartly ,congratulations,Sir .You are very user friendly and excellent co-operation.Pls keep it up. Congratulations! I never had a doubt since the day I joined. Though I have yet not taken full advantage of all the features , knowledge and tools that Zerodha offers. But that is due to my own lack of dedication. I wish Zerodha continues to reach higher goals and many more awards. Thank You. Congratulations to you and your great team. Please keep up the good work. Hearty congratulations to our own Bangalore Boy and his Team for Making us Self Reliant through the UNBELIEVABLY Extraordinary platform for us and making us Financially Secure. More power to you and wish You more MILESTONES in the Near Future !!! Congrats , I am proud that i am part of Zerodha. Very good support i get from Prasanth when ever i call him without any negligence he support me lot, that really motivates me lot. Happy Journey to Zerodha we should sustain ever year to get this award. Happy Trading friends. 1. As a tiny daytrader, ( and that too losing ) I am very happy I switched to Zerodha. At the end of the year brokerage savings is huge plus. 2. Another great plus is you guys don’t recommend any buy or sell. That is great. 3. Brokerage firms in US markets also charge very low. 4. Why dont you tie up with world class charting software like NT. ? A mild increase in brokerage is more than welcome. 5. Why dont you add feature at cost. Like messge after every trade whether done by you or us, at some monhly cost? This could be optional. 6. You also give scanners, (in pi) auto tetsing etc. That is also a huge plus. Because nobody else in India gives it. IMHO. Good keep maintaining and improving. Best of luck. Point 5, we are working on it, we will keep your posted. 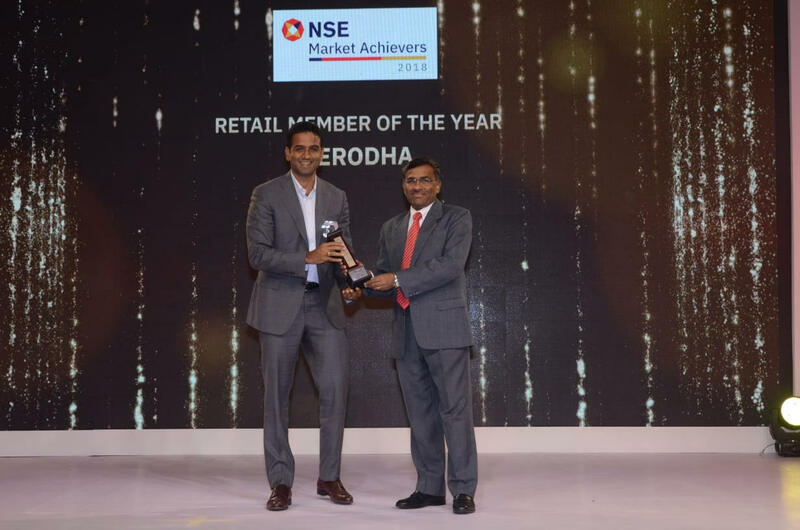 Congrats Nithin Kamath ji, Love you zerodha…!!! Keep Rocking……and Making new achievements and scaling Newer Heights…with Zerodha`s Kite! Unfortunately,We don’t intend on offering monthly brokerage plans anytime soon! I am very happy to know that I am with the right persons. Zerodha is doing the fantastic job. And this is the only Broker which I refereed to my Friends and Family. And now I feel that I was not wrong certainly. Thank you For Zerodha Teem. I Wish you All the best fro your prosperous feature. I am a very happy customer of Zerodha. I used to be very loyal customer of Kotak Securities, but no more. I have transferred all of the holding’s of Kotak Securities and closed that account completely. I wish Zerodha best of luck for the future and pray they achieve even higher milestones. CONGRATS TEAM ZERODHA….! !Thanks for your valuable service,keep it up. Great going Zerodha. Congratulations on this success. Congratulations to Zerodha, but zerodha need to improve in options Margin Calculation Process, many times it shows margin available and next day(over night positions) when we see statement it shows short of Margin and after couple of weeks says that penalties are charged , end of the day brokerages saved eaten up by Exchange penalties which is more than what got saved , why can’t it clearly stops extra positions when there is short of Margin, how can end user know this until unless you stop showing available funds and clear indication of extra margin usage. We’re sorry to hear that Venkat. We will work on improving the way we communicate margin shortfall. Also, please refer to this article on our support portal to know how much margins you have available to trade without being charged penalty. Also, margin utilization can be seen on the margin statement – refer to this article to know more. I have one simple question , when site shows day time funds available and overnight statement shows short of margin and next day again funds available, will it not be confusing and unnecessarily paying penalties, why daily margin statement and kite website not in sync in terms of funds and margin. Congratulations Mr.Kamath and the Zerodha team!!! I am a happy customer and have got few others also to open account with Zerodha. Keep it up with the new products and yes, the Varsity learning portal is the best one I have come across!!! Congratulations sir, Zerodha is one of the best platform in trading business. expect more trader friendly features in future. Many many congratulations on this success team zerodha and wish you all the best for future. Congrats the team who break the barriers eventually and make the way for everyone to trading with complete knowledge with ‘varsity’ it considered as a stock market University. Kudos to Zerodha team .. Wish your service and platform reaches to Tier2 cities and bring more participants to the market. Congratulations to Zerodha team. I am a beginner to investments and I have started with Zerodha. It’s been a great experience. Please keep up the good work. Congratulations you make my day every day . Congratulations to Zerodha team. It’s never easy to reach this level. Hearty Congratulations to Mr Nithin and Zerodha Team. Wish you many similar accolades in the future. well, I did not like the word trader in the beginning. I am an investor and I don’t want to do trading. ZEROdha became HEROdha again, CONGRATS all the team for the super achievement. Perhaps others feel threatened by the rapid rise in your popularity. If others are reacting so adversely to your success, then you must be doing real good. As your client who has benefited immensely from your platform, products, and services, I would say you thoroughly deserve all the accolades coming your way. Wishing you even more success in future. Good luck. That’s great to hear, Nitin. It’s great to see such technology being home-brewed in India, and owned by Indian stakeholders rather than selling out stake to foreign investors. I look forward to seeing Zerodha as a Unicorn in the coming years and prosper amongst the startup space. Congrats to Zerodha Team for such great Achievement. I am happy to be your client. All the very best to your future. Congratulations Nithin Sir ! You proved them wrong just because you have faith in you. I always recommend Zerodha when someone asks me to open an Demat account. I was looking at 2 articles yesterday in a fin website – anyone with a little fundamental and technical knowledge can easily discern why these are written in the first place 🙂 to create liquidity for the big fund houses at the cost of retail traders (paid news). I cannot forget my experience with other brokerages seeing half of my capital evaporating in derivative trade fees overnight…in the name of service!! Zerodha his indeed changing the eco-system in India. Zerodha is for retail traders. Period. Let no one peddle cheap news insinuating anything else. Nithin Kamath and team, you are doing a good job. Go on, we are with you. Hearty Congratulations. You are truly an inspiration! i am filling very proude to be with no 1 firm. Todo things in silence and do hardwork. Hope to win more in future which you deserve for the caring the clients. Keep Innovating and improving trading / investing platform experience. Congrats Zerodha team, Great going !! Congratulations to Zerodha and Mr. Nitin for this achievement. Although, a concern I have is with the Zerodha customer database. I feel either it has been sold/leaked/hacked to outside market. There have been a lot of calls from the so called ‘Research Firms’ claiming to provide stock tips. Also, they know about my trades done just 2 or 3 days back. There is no way this was known to them without some major data leak. And this is happening to a lot of folks I know who are in short term trading. Just sharing my views. Thank you for the prompt response. I have been reporting these numbers on the TRAI app, but the list seems never-ending. I being a retail investor may never get to know where is this being leaked from, but thanks for the assurance at least that Zerodha acknowledges this issue and is working towards resolving this. Congratulations to all team members of Zerodha. Team zerodha good luck for next level. Greatful to be connected with Zerodha..My favourite investing platform. They deserve the award.CONGRATULATION. I personally love using coin. It has made investment in mutual funds very easy for me. Congratulations to team Zerodha. Keep up the good work 😀. I chose Zerodha by accident and opened an very casually, I had no idea about stock market. But Alhamdulillah (Thank God) i made the correct decision accidentally. Zerodha is really the Best Brokerage firm in India. All the rumours came from jealous. Don’t care them. We trust you. Because we know you are the best. I chose Zerodha by accident and opened an account very casually, I had no idea about stock market. But Alhamdulillah (Thank God) i made the correct decision accidentally. 100% deducted services with absolutely free of cost zerodha will win more achievement in future im sure. last one year im using zerodha kite as my favourite trading platform,my sincere thanks from the deep of my heart. Many congratulations Sir, to you and your team Zerodha for winning prestigious NSE award. I wish you all the best for further achievement in your field. Super zerotha .But only one is negative .Please don’t fix daily range to banknifty option.this is give a some negative to me and my friends.so don’t fix range in option. Best luck for bright future. Congratulation Team Zerodha, Only firm in india who serves better for trader. Go Zerodha, Go Trading. Jai Hind. Congrts. It is really excellent achievent of Zerodha entire team. Heartiest Congratulations to Mr. Kammath & his team. Please keep up the good work and never let investors down. Zerodha is setting benchmarks for other brokers to follow. Congratulations Amazing indeed.Mumbai brokerage cartel must be really worried boys from namma Bengaluru have stepped up the heat.Way to go.Dream Big . Congratulation sir, Good luck for next achivement. I feel proud of you and being a small invester feel safe too since you are the right brokage house i should be with. By the way would you please start btst/stbt ? Well i know the problems-but still you are the best without those.THANK YOU, YOUR TEEM. We already allow BTST trades. Although check out these risks invlolved. STBT wouldn’t be possible until Stock lending and borrowing picks up some more liquidity. I always get myself educated from your versity. and I have started doing intraday trades in a very very small way. I read on net about rs 32 lacs compensation payment NSE arbitrators have slapped on you. What is the real storey ? I cannot believe that your firm can do the square of without informing the trader. I am sure you will fight it out to the last resort to get the justice. Wish you all the best. Congratulations Nitin. You are doing a great job. You have been of immense value for small investors whose huge money was going waste in the form of brokerages to big corporate. You have set an examples. I wish you all the very best. heartily congratulation to team zerodha. Wishing you to touch new heights. Congrats Nithin ,Zerodha team and Zerodha community. Keep up the good work as always.Keep improving day by day. One query,When can we expect much needed update(with new features) for Kite web and Mobile app? Thanks a lot for the awesome platform. We are working on a new Kite mobile app. We will keep you posted. Congrats to Zerodha….. but as a client I feel very disappointing that is they charged to me and debited a some of huge amount from my a/c with out any warn or informing me ..and after that I had send several mail to the customer care till now they not respond me ……..they has lot of more hidden high charge which is not slimier like other broker house…… this is very much negative point of Zerodha….just disgusting…. We do not have hidden charges, We are very transparent with our pricing and various charges. They’re all mentioned on https://zerodha.com/charges. Sir Congratulations. Please make more easy to use like inbuilt stocks user friendly in one page all stock’s to be displayed. User can easily use to see the chart and trade instantly. We don’t plan on introducing pre-filled market watch on Kite. Also, you can add upto 40 stock on a single market watch and 200 stocks overall. Congratulations sir,Big power for you. कर भला सो .,होगा भला. Hearty Congratulations Sir to all of your dedicated Team..
Congrats team Zerodha and thanks for next level tech and support providers for Indians. You as well as us, we all will grow slowly and slowly, just a thing, it’s a request from all of us that please work more on crashes we face on volatile days,if you could. Thanks and congrats once again for your endeavor. We have implemented redundancies/backup systems to prevent such incidents and we will continue to work on improving our platforms. Best broker and discount brokerage schem..
First of all…. Congratulations to team Zerodha….. Today I feel this award for me also as I have attached with this team since last three years. I have referred my 9+ friends to open account with Zerodha and today I have great pleasure to say that approx 10+ of my friends are having their account with Zerodha. to Zerodha team. Congrats to the Zerodha team. Congratulations to the entire family of Zerodha. Congratulations. Keep scaling new heights. Congratulations zerodha team, keep it y up. Congratulations. Your portal is very user friendly especially instant display of funds available for delivery based trading. My daughter as NRI is using another leading trading site who are also registrars for many issues and mutual funds but often complains about unfriendly software and necessity of changing password every week. Best wishes for future and many congratulaions. Request you to support us with eliminating restriction in the Bank Nifty contracts. Everyday the notification ‘RMS:Rule & allowed for trading: 26XXXX TO 26XXXX CE AND PE. This is really unhappy that when we do trading on a regular basis. Hearty Congratulations…!!!! I am proud to be a investor with you. I am enjoying the trading platform provided by you. However it will not be odd to mention that if u improve in some fields, it will be more attractve and helpful. First, if u provide all the operations on one page of kite instead of going to console etc. as other DPs provide, it will better. Secondly, some of your customer executives need to be trained how to interact with clients politely and with full knowledge of the subject, I observed that they try to misguide in rude conversation. So, please improve in this field to become the best. This is just a suggestion. Congratulations again for your achievement which you certainly deserve…..
To know why we don’t provide all operations under one, please refer to this support article. With regards to customer service, we’re sorry to hear that the customer support reps were rude. We will continue to work on improving our customer service. I am sure, the mission will continue & you will achieve more & more Awards in future. Good luck to Zeroda team. Best of luck for the future and we happy !!! Congratulations Kamath sir, for your continuous victoy in getting awards along with your team. Efforts behind this always works. I am very late in getting services in your company. Suggest to upgrade kite like Trade tiger which will promote senior citizens. Regards. A heartiest congratulations to you and your team, the Zerodha family, wishing you a great success in any endeavour. Please do concentrate on the small hitches and open issues that are present as tickets for the Kite platform and resolve them, then there is no looking back! We will continue to work on improving or platforms and trading/investing ecosystem. Plz add notification menu in which latest news and zerodha suggested trading are available. It’s make more effective your app. we don’t provide advisory services, so we wouldn’t suggest any stocks to trade in. You can keep track of latest events on Kite using the stock info widget. Refer this article to learn how. யானை அதெல்லாம் கண்டுக்க கூடாது ..
Wishing you all success and scaling of new heights. Congratulations to the entire Zerodha Team!! You deserve all the accolades. I was apprehensive at first, to shift from a reputed name like HDFC Securities to Zerodha. Its been a year since I have shifted and I have executed several trades. No complaints at all, so far! One suggestion to upgrade your services – provide an option for entering a “Good Till Date” (GTdt) order. We are working on having GTC/GTD orders on our platform. We will keep you posted. congratulations to you and zerodha team… if possible please enable buy sell call tips…. I have been associated with Zerodha for almost 3 years. I find your trading platform easy to use. Now I have started using Coin and moving all mutual funds investment through Coin. I was bit doubtful about the model used by Coin. After this award I am feeling confident and comfortable making investments using Zerodha. Keep it up. To add on, Zerodha has good learning material as well which explains the concept that is easily understood by a novice as well. I have started active trading purely by going through your learning documents and have gained in terms of both knowledge & financially. I know this is not the place to express my problem but there is no other option left for me. I have given my 100 shares of GSK PHARMA for dematerialisation for more than two months now, I am sending mails at suport.zerodha.com tickets are raised every two days, but no body is answering my emails, on telephonic calls operator keeps me on hold for long time and no body wants to answer my calls,and says they will reply later. This not the way to behave with the customers. What I am supposed to do, at list let me know whats happening with my shares. Please look in to this and do the needful at the earliest. That’s great news. Congrats team Zerodha! You deserve it, and it’s not only by your application, but I also say it with your all product and services. Thanks to me that I join you as my broker. I just have a request for a feature in your charting with Kite. In Renko we specify the box size but the complication comes because of the time interval that is chosen from the top menu (like 1m, 3m, 5m, 10m, etc…). Because of this “additional” time constraint, Renko boxes that appear are forced to disappear if price retraces within that time frame. This is an unnecessary complication which is not there in many foreign (US etc) brokerage platforms. Renko is supposed to be a time-less chart. Then why bring in time dimension in to it? Please remove this need for time spec. for Renko. A box once completed (painted) should NOT be removed from the screen. If you provide this feature then we can make a meaningful analysis based on the historical Renko charts and we can think of a strategy to trade with it. So, I request you to Please implement this time-less option for Renko as soon as possible. Congratulation Zerotha team and Nithin Sir. your Learning platform are really awesome , I am new in capital market but learning a lot from Varsity and your YouTube channel. Congratulations to Bro Nitin , Very happy News Really and also thanks to Zerodha Team supporters starting from registration officers to custumer care groups etc. who have programmed their mind for immediate reactive positive response who needed it. I also think that (1) its a part of your journey not the final destination (2) these trends of constant improvement within limited time will continue in future till the pulse. Best Wishes to NSE MARKET ACHIEVER 2018. Happy New Year 2019. Congratulations !! You are the # 1 broket. In my views, only two-ways people can earn money in the market 100% +.